Originating in Japan, Japanese rain chains were invented as a mechanism for transporting rain water from the roof into a container for their own use. Through the evolution of technology, rain chains have developed into decorative and ambient alternatives to downspouts. Rain chains use a combination of chain links, cups, and round surfaces to allow water to smoothly run down the rain chain and either into a container or onto the ground. While the water travels down the rain chain it creates a sound that is relative to that of a waterfall, which most users find calming and peaceful. This usually is the reason why most of our customers buy rain chains for gutters. Gutter downspouts serve their purpose of transporting rainwater down from your gutters to the ground, but most tend to have a loud dripping sound that can easily annoying the house’s residents. If you are looking for a quieter alternative to the typical downspout, you might want to try a rain chain downspout. Rain chains offer a nice and pleasant waterfall-like sound that creates a peaceful ambience during rainy days. Not only that, but the aesthetics of the water traveling down the rain chain can be entertaining to watch. Most people install rain chains in front of frequently visited windows such as bedroom or kitchen windows. This way, they can watch the rain chains as water pours down them. There are many different styles of rain chain downspouts, both with a variety of decorations and materials. Longmont Gutters’ masterful craftsman are capable of designing rain chains that create a “spinning” effect as the water runs down. With so many designs out there, there is definitely a rain chain for your gutters and home exterior style. 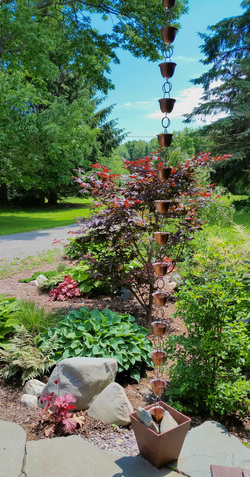 ​We offer many different colors and options for materials such as aluminum or copper rain chains. Give your home exterior a nice, decorative appearance and add to the ambience of your home. Rain chains go great with our seamless gutters to optimize your gutter system’s efficiency and provide both a modern and a traditional look for your home. Rain chain downspouts offer a much quieter alternative to the typical gutter downspout. Downspouts also have edges and corners that can potentially collect leaves and debris; something that rain chains for gutters do not have. This allows for the easiest gutter cleaning when paired with our seamless gutter systems and our efficient leaf screens. If you want extra ambience, ease of cleaning, and efficient gutter systems, rain chain downspouts are definitely the way to go. You may decide that your home doesn’t allow for traditional style curiosities, then take a look at all of our designs and colors. 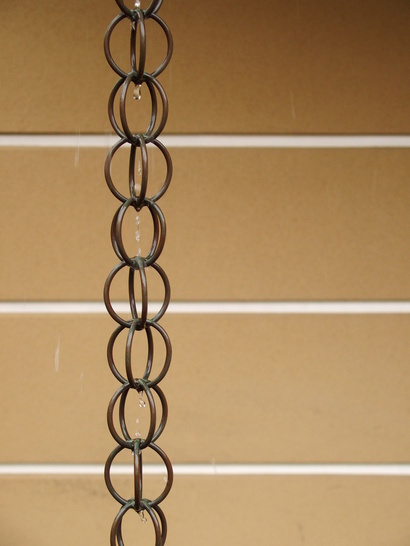 We offer more modernized rain chains that are simple chain links designed to match the rest of your modernized gutters. Whatever look you are going for, Longmont Gutters’ has the rain chains to match it. There’s no reason to not uplift your gutter system with these affordable and effective rain chain downspouts and trash your old downspouts. If you're interested in adding a little flair and panache to your gutter system, give us a call! We'd love to talk with you to learn about your particular needs and to discuss ways we can help.